Questions and Worked Solutions for AP Calculus AB 2017. 1. A tank has a height of 10 feet. The area of the horizontal cross section of the tank at height h feet is given by the function A, where A(h) is measured in square feet. The function A is continuous and decreases as h increases. Selected values for A(h) are given in the table above. (a) Use a left Riemann sum with the three subintervals indicated by the data in the table to approximate the volume of the tank. Indicate units of measure. 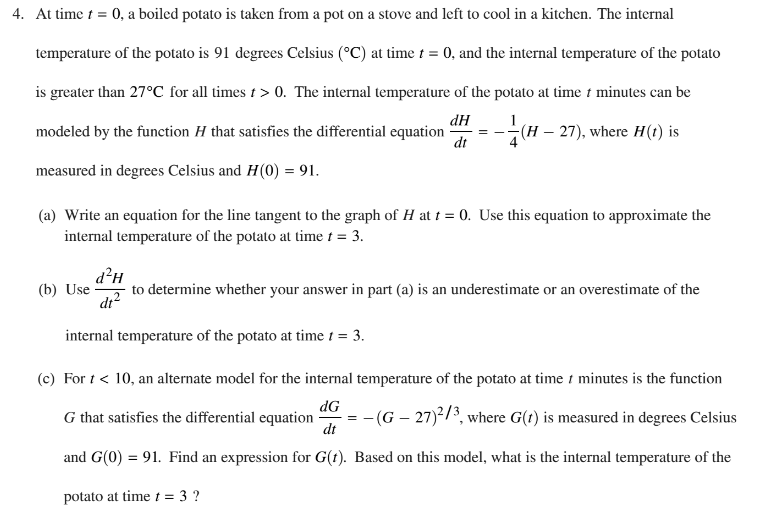 (b) Does the approximation in part (a) overestimate or underestimate the volume of the tank? Explain your reasoning. (c) The area, in square feet, of the horizontal cross section at height h feet is modeled by the function f given by Based on this model, find the volume of the tank. Indicate units of measure. (d) Water is pumped into the tank. When the height of the water is 5 feet, the height is increasing at the rate of 0.26 foot per minute. Using the model from part (c), find the rate at which the volume of water is changing with respect to time when the height of the water is 5 feet. Indicate units of measure. (a) How many pounds of bananas are removed from the display table during the first 2 hours the store is open? (b) Find f'(7) . Using correct units, explain the meaning of f'(7) in the context of the problem. (c) Is the number of pounds of bananas on the display table increasing or decreasing at time t = 5? Give a reason for your answer. (d) How many pounds of bananas are on the display table at time t = 8? 3. The function f is differentiable on the closed interval [−6, 5] and satisfies f(−2) = 7. The graph of f', the derivative of f, consists of a semicircle and three line segments, as shown in the figure above. (a) Find the values of f(−6) and f(5). (b) On what intervals is f increasing? Justify your answer. (c) Find the absolute minimum value of f on the closed interval [−6, 5]. Justify your answer. (d) For each of f"(-5) and f "(3), find the value or explain why it does not exist. 5. Two particles move along the x-axis. For ≤ t ≤ 80, the position of particle P at time t is given by xP(t) = ln(t2 - 2t + 10 ), while the velocity of particle Q at time t is given by vQ = t2 - 8t + 15. Particle Q is at position x = 5 at time t = 0. (a) For 0 ≥ t ≥ 8, when is particle P moving to the left? (b) For 0 ≥ t ≥ 8, find all times t during which the two particles travel in the same direction. (c) Find the acceleration of particle Q at time t = 2. Is the speed of particle Q increasing, decreasing, or neither at time t = 2 ? Explain your reasoning. (d) Find the position of particle Q the first time it changes direction. 6. Let f be the function defined by f(x) = cos(2x) + esin x. Let g be a differentiable function. The table above gives values of g and its derivative g¢ at selected values of x. Let h be the function whose graph, consisting of five line segments, is shown in the figure above. (a) Find the slope of the line tangent to the graph of f at x = π. (b) Let k be the function defined by k(x) = h(f(x)). Find k'(π). (c) Let m be the function defined by m(x) = g(-2x) • h(x). Find m'(2). (d) Is there a number c in the closed interval [−5, -3] such that g'(c) = −4 ? Justify your answer.